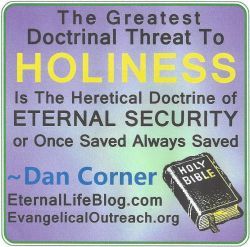 As we follow the Lord Jesus (who is ETERNAL LIFE), we also teach about immortality, everlasting life, salvation, eternal life, living forever, etc. Catholicism Excludes The Father From The Throne! What Is A True Preacher of God’s Word Really Like? Chick Tracts Are NOT Sound – BEWARE! David Brickner of Jews For Jesus Opposes Jesus’ Teachings! Which Type of Wisdom is Yours? 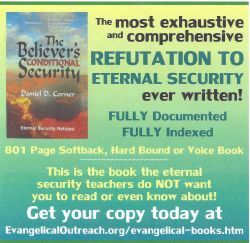 According to the Bible, eternal life is much more than just the gift of God (Rom. 6:23) and a present tense possession (Jn 6:47; 1 Jn 5:11-13). Eternal life is also a hope (Titus 3:7) yet to be reaped (Gal. 6:8,9), in the age to come (Mk. 10:30) for only the ones who persist in doing good (Rom. 2:7) and don't grow weary and give up sowing to please the Spirit (Gal. 6:9)! Eternal life is also a promise for the Christians who hold on to the gospel truth they heard from the beginning to remain in Christ and the Father (1 Jn. 2:24-26).